For the data industry, manufacturers and emergency service providers, power outages just aren’t an option. Even the few seconds it takes for a modern generator to come online can be disastrous. If critical equipment so much as shudders, carefully timed factory lines create defective products, crucial financial data can be corrupted or lost and even more dire, hospital life support systems may stumble. That’s why these sectors count on technologies called uninterruptible power supplies (UPS) to cover the transition from the power grid to a backup generator. Active Power, part of the Piller Group and ultimately owned by the UK engineering conglomerate Langley Holdings PLC has a UPS solution using a specialized rotating metal disc about as wide as a truck tire called a flywheel. When their customers request it, they place it inside a customized container such as our conex equipment enclosures and shelters. 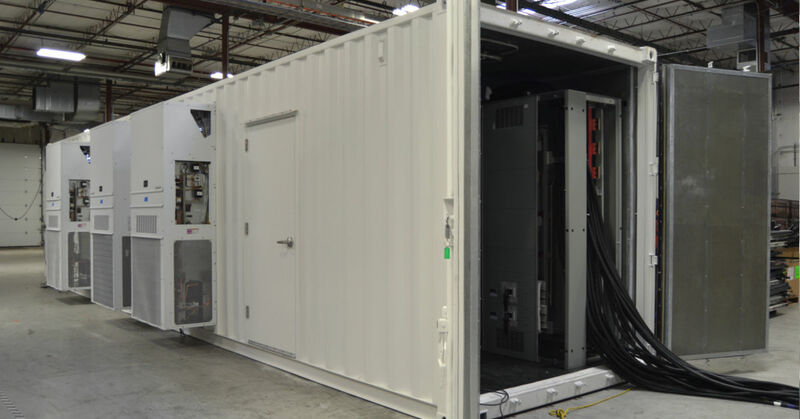 We worked with Active Power to design a containerized UPS equipment enclosure that could house a backup generator, switch gear, and UPS system all in one portable unit. During a tour of their facility, Active Power showed Falcon’s marketing team an opened-up version of their flywheel. When we saw the flywheel spinning in a finished version, we noticed that after a simulated power outage, it kept turning longer than we would have expected, especially considering its weight. This is because Active Power has designed their system to have minimal friction. Fully enclosed in its shell, the flywheel maintains its momentum even longer thanks to a vacuum seal and a system of magnets that have a lifting effect. In real-world applications, power from the grid flows into the facility and spins the flywheel in passing while it simultaneously supplies the load. If power from the grid suddenly cuts out, the flywheel will keep turning and power the facility with its momentum until the generator assumes the load. Often, batteries have filled the gap between grid power and generator power but switching to flywheels has numerous advantages. 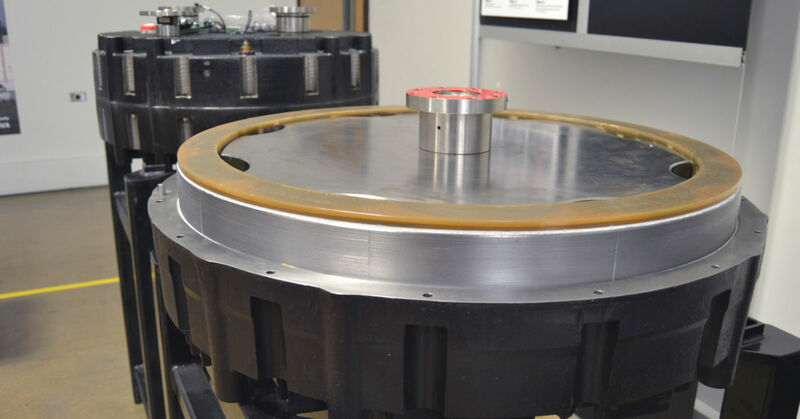 Unlike batteries, flywheels don’t degrade over time, making them 12 times less likely to fail in an outage. End users also don’t have to continuously replace batteries, a significant cut to the UPS’s total cost of ownership. Flywheels take up less space and are more environmentally tolerant, making them far better for containerized solutions. The inherent mobility and small footprint of a conex ups equipment enclosure would enable the customer to place the UPS with minimal site prep, and the unassuming exterior would hopefully go unnoticed by vandals. 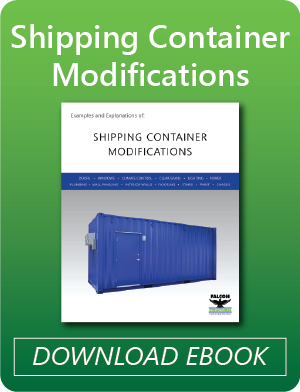 Designed with the specs of a type 3R enclosure the container can be placed inside or outside the customer’s manufacturing facility, maximizing their flexibility. To keep their equipment cool, we also added cut-outs for industrial grade air conditioners and utility ports. Perforated steel walls on the interior helped deaden the noise of the air conditioners and created a sleek industrial appearance. Normally when we ship out a conex equipment enclosure, we can only imagine what the final product will look like, but this time we got to see the loaded container in Active Power’s facility. 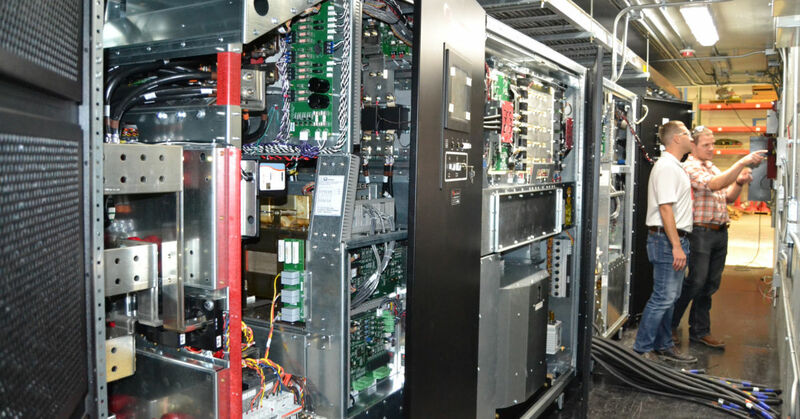 Filled with hundreds of feet of cable and Active Power’s flywheel UPS systems, we could see it was ready to start a second life as the solution for power outages. Seeing our work in action meant a lot to us and we appreciate that the Active Power team took the time to show us yet another use for shipping container equipment enclosures. You can always contact us at 877-704-0177 or sales@falconstructures.com if you have more questions. Active Power designs and manufactures flywheel uninterruptible power supply (UPS) systems, modular infrastructure solutions (MIS), and energy storage products for mission critical applications worldwide from its headquarters and manufacturing plant in Austin, Texas. The company was founded in 1996 and became public in 2001(NASDAQ listed); until acquired in November 2016 by Piller Power Systems Inc, the US subsidiary of Piller Group GmbH. Today, customers are served via Austin and the Piller global network of subsidiaries and service centers that support the deployment of systems in more than 50 countries. Active Power and Driven by Motion are registered trademarks of Piller Power Systems Inc. The Piller group is a division of the UK engineering and industrial group, Langley Holdings plc.